At Last! You Can Affiliate Market SeamlesslyWithout Irritating Visitors to Your Sites! With the Affiliate Marketers Toolkit, YOU Can Increase Click Rates by as Much as 900! Lets face it, affiliate marketing sounds easy, but its actually pretty tough! Theres no doubt, its probably the most difficult thing for any site owner to master. Frankly, affiliate marketing is the only thing about site-building you cant fakeeither the clicks are there, or theyre not. And when theyre notthe checks are small. And maybe youve tried other affiliate marketing tools, but found that you practically had to be a brain surgeon to figure it out. But now theres good news! And the good news starts with my own personal bad news. I was like you, struggling to try to make money from affiliate marketing. I spent hundreds of dollars on all sorts of fancy tools to try to spiff up my site so that visitors would click on the links. And then I spent weeks upon weeks of my time trying to use those toolsand none of it worked. And since most people use pop-blockers these days, I wanted un-blockable pop-us. Preferably ones that use the visitors e-mail client, so I can collect e-mail addresses. It took months, but my buddy finally delivered the goods. And WOW, did he ever! It wasnt just a program. It was the most AWESOME, purely powerful affiliate marketing tool Ive ever seeneverything Id asked for and more! This incredible tool is actually 3 tools in one, and theyre the quickest and easiest way to affiliate market. Inside this magnificent tool is absolutely everything you need to start increasing your click rate and raking in the big bucks! When visitor clicks Send, youve captured their e-mail! Collects e-mail addresses even if youre marketing someone elses products as an affiliate! 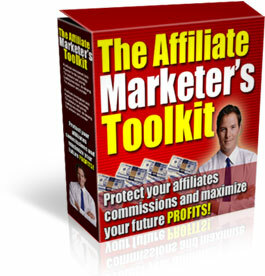 As you can see, The Affiliate Marketers Toolkit really is the ultimate affiliate Internet marketers tool set. Just imagine being able to cookie visitors, get their e-mail addresses, and get them to click much more oftenwithout them getting annoyed and leaving!